Have you ever gotten hold of a product on accident? Then when using it, you realize you can go a whole day without styling after you use it? That is how Curl Junkie Curls in a Bottle worked for me. I had never used a curl serum before this year, and now I cannot believe it took me this long to try one. I purchased Curls in a Bottle on a whim because I was attempting to get the free shipping deal online at CurlMart. While browsing, I came across this 'silicone-free serum' that promised to help maintain and enhance my natural wave definition while controlling frizz. I was sold. Who is the serum intended for? This serum states that it works well for type 2 and 3 wavy-curly hair. I also liked that it can be used as a standalone product for fine hair. While coarser textures can use the serum as well, in order for it to perform well, I would recommend layering another styling product for the best results. I was happy this serum did not add weight to my 2c waves. It also played well with my cream and gel cocktail without causing flakes. Since purchasing, I have found multiple uses for it in my personal wavy hair routine. Before I apply another product in my soaking wet hair, using Curls in a Bottle as a base styler reduces frizz and enhances curl definition for multiple days. It works as a standalone to prevent poofy bed head, too. I can use it as a hair refresher. On second day hair, I dampen my waves and smooth the serum over. Then, scrunch for natural formation. While some products can have an obvious impact on your hair, this serum is more of a background player. By that, I mean that you may not realize how well it is working until you realize you can go without it the next day. After a few weeks of using Curls in a Bottle, I has not been quite convinced it did enough to warrant me purchasing again in the future so I decided to go a wash day without using it to see if I noticed a difference. 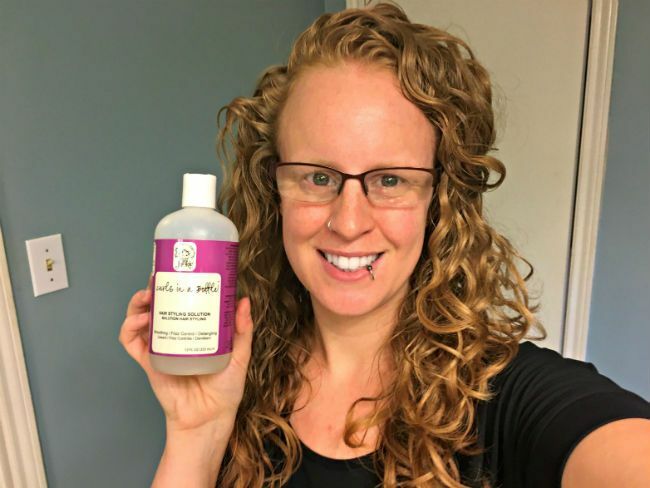 While the difference wasn’t immediate, throughout the day I started to notice that I was getting more frizz than I had been and one of the biggest differences I noticed was the lack of softness of my hair. This serum from Curl Junkie was able to help keep my hair moisturized and soft under the usual hard hold gel that I like to use, which is no easy feat. It also acts as a workhorse for refreshing my second day hair with minimal effort. I accidentally found a styler that has earned a coveted place in my routine--indefinitely. When is the last time you found love on accident with a product? Do tell. Leave us a comment below. Subscribe to my YouTube channel, The Polished Curl.